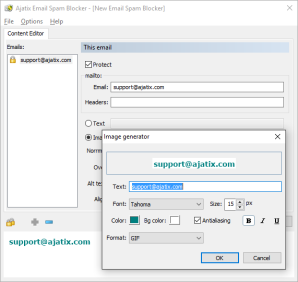 The Email Spam Blocker Dreamweaver extension is an effective solution to the email harvesting. It allows to hide email addresses from spam bots, while leaving them readable and accessible to human site visitors. Full cross-browser compatibility - works in all currently used browsers (Chrome, Firefox, Edge, IE8 - IE11, Safari, Opera, etc. ), degrades gracefully in very old browsers. Valid HTML and CSS - email spam blocker markup complies with HTML, XHTML and CSS standards and passes W3C and Dreamweaver validity checks. Unlimited number of sites - use this extension to protect email addresses on as many sites as you need.